Open iTunes and connect the iPhone to your Mac. Press and hold the Home button and the Sleep/Wake button at the same time. After exactly 10 seconds release the Sleep/Wake button. 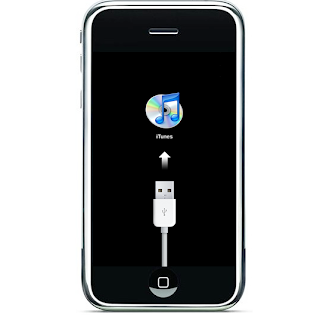 Continue holding the home button until you iTunes pops up a message telling you that it has detected an iPhone in recovery mode. NOTE : It may take a few attempts to get your iPhone into DFU mode. Generally, I hold down both buttons then release the Home button just before I think the Apple logo would appear. If you are still holding both buttons down and you see the Apple logo you are holding them down for too long!